Show your love for the Attic with one of our branded mugs, tumblers, or apparel (coming soon)! Bring the Attic to your home with this microwave- and dishwasher-safe mug, identical to those used at the shop! Holds 12oz of your favorite beverage. 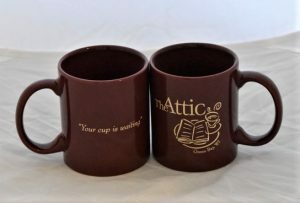 Bring the Attic to your home with this microwave- and dishwasher-safe mug, identical to those used at the shop! Holds 16oz of your favorite beverage. 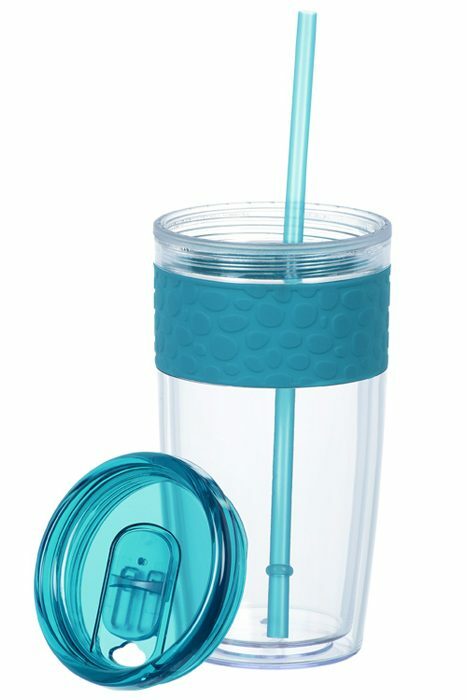 Enjoy your favorite 16oz drink in a sleek, double-walled tumbler that won't sweat on your desk top! 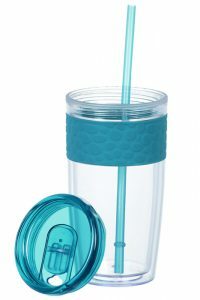 With a removable, matching straw, a screw-top lid to prevent spills, and a pebbled grip, this cup is perfect for those on the go! Bonus benefit: bring your tumbler to the Attic to get your favorite drink, and receive $0.25 off! This 16oz travel mug will keep your drinks hot or cold for hours! Will an easy to remove lid, sleek appearance, and curved silhouette for an easy grip, this mug is perfect for those on the go. 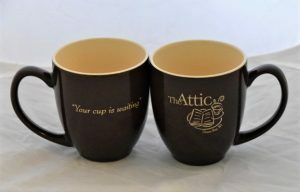 Bonus benefit: bring your mug to the Attic to be filled with your favorite drink, and receive $0.25 off! For coffee lovers, there can be many perks to branching out beyond your basic drip brew. Choose from a variety of sleek, easy to clean coffee makers. Whether you prefer cold brew, French press, or single-serve pour-over, we've got you covered! This 32oz. 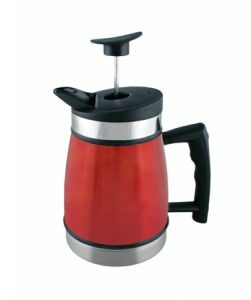 French press is a sleek and durable model that is sure to please. 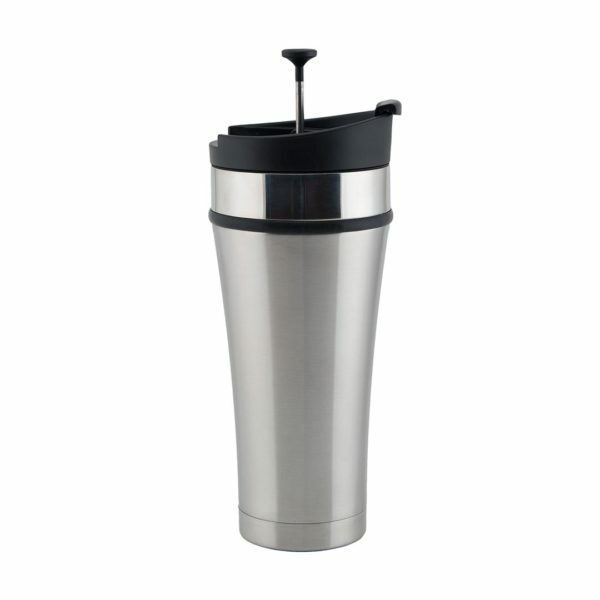 Made of double-walled, vacuum-insulated, stainless steel, your coffee will stay hot for hours. 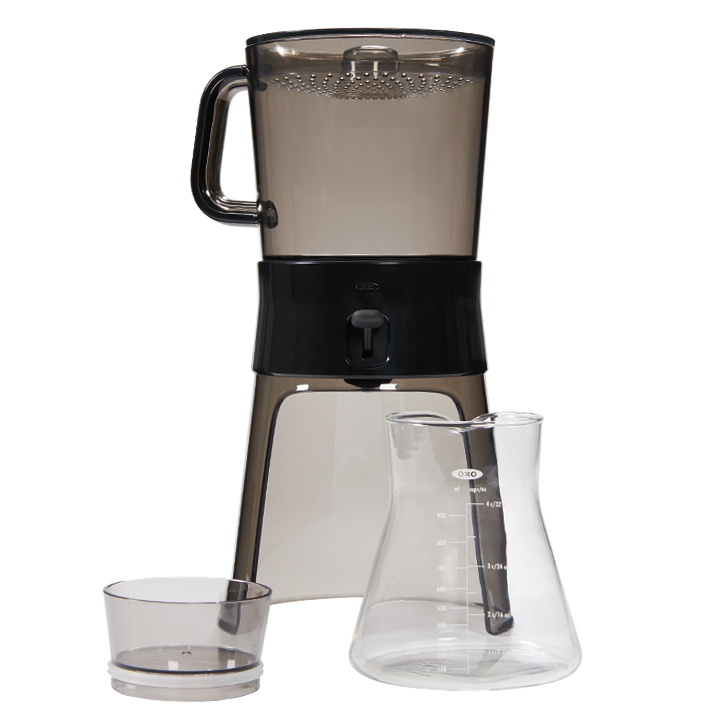 The double filtration system guarantees a clean brew, while the detachable filter makes for easy clean-up. Available in red and black; check store for current models. The durable OXO Cold Brew system is easy to use, easy to clean, and can make enough concentrate for up to a gallon of smooth, sweet cold-brew coffee at a time. Comes with starter-pack of 10 OXO cold brew filters. Due to the long steep time and cold water used in the cold brew process, many of the fatty acids and oils responsible for the bitter edge found in hot, drip-brewed coffee are not extracted, and thus not present, in cold brew. Only the favorable flavor notes and caffeine are extracted. This results in a smoother, sweeter brew. The OXO system is the same cold brew maker we use in-store to prepare our popular cold brew coffee. 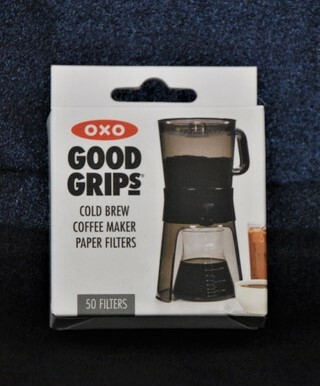 For use with the OXO Good Grips Cold Brew Coffee Maker. Comes in packs of 50. We have found a simple pour-over system that works well and is easy to use and clean. 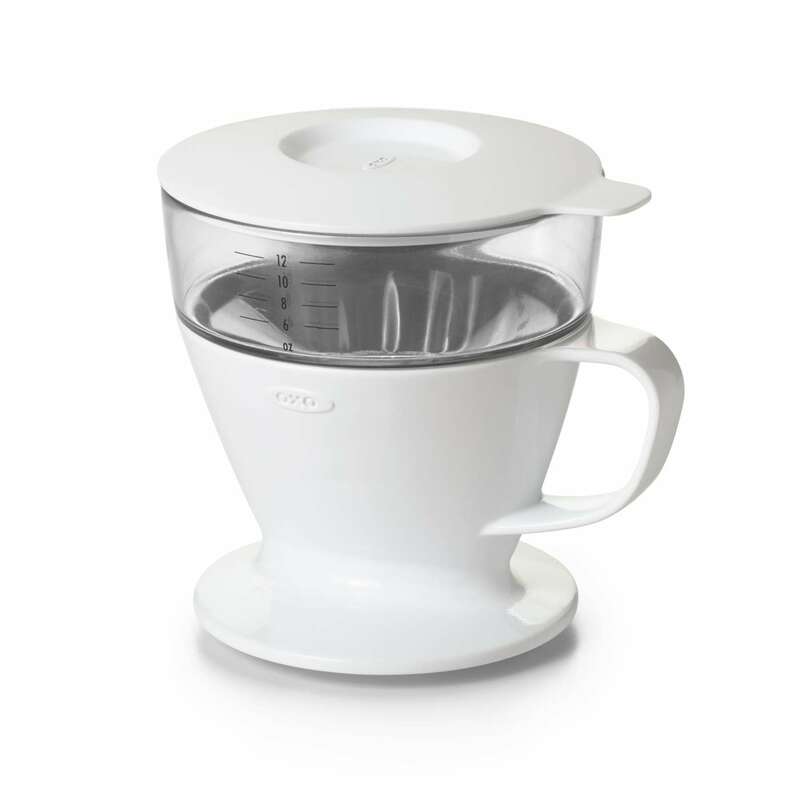 The OXO pour-over coffee maker creates consistent, flavorful, single cups of pour-over coffee with minimal effort. With a water tank designed for even, automatic water distribution, an ideal brew time is guaranteed. 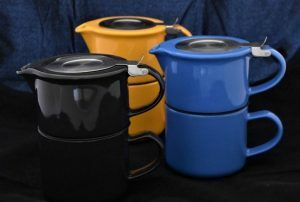 The system rests securely on a wide variety of mug sizes, while the lid both retains heat during brewing and doubles as a drip tray after removing the system from the mug. 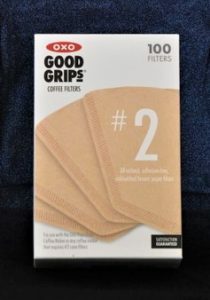 Comes with a starter-pack of 10 OXO pour-over filters. A perfect fit for our OXO pour-over system! Comes in packs of 100. Enjoy the second-most popular beverage on the planet in style by brewing it in your favorite pot or mug! We carry a variety of styles and sizes, guaranteeing you find the perfect fit for home, office, or on the go! 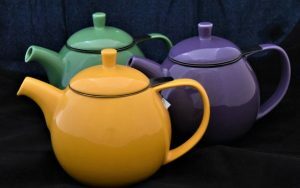 This 24oz., curved, porcelain teapot, complete with an extra-fine, stainless steel infuser, is ideal for steeping fine, loose-leaf teas. The matching porcelain top has a silicone rim to hold it in place as you pour. All pieces are lead-free and dishwasher safe. Comes in red, carrot orange, mandarin yellow, lime green, turquoise, blue, purple, grey, and black. Check store for current availability. 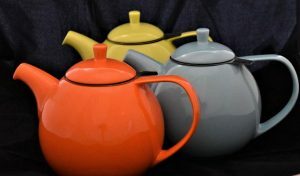 This 45oz., curved, porcelain teapot, complete with an extra-fine, stainless steel infuser, is ideal for steeping fine, loose-leaf teas. The matching porcelain top has a silicone rim to hold it in place as you pour. All pieces are lead-free and dishwasher safe. Enjoy your tea in this wide-mouthed mug! The extra-fine, stainless steel mesh infuser allows tea to expand more fully, guaranteeing a rich flavor and aroma. The stainless steel lid holds in heat and doubles as a holder for the infuser, allowing you to easily re-steep your leaves. Pastel colors have a smooth satin finish; all other colors are glossy. Easy to clean. Comes in red, carrot orange, mandarin yellow, lime green, turquoise, blue, purple, grey, black, lemongrass (pastel yellow), lavender mist (pale lavender), and minty aqua. Check store for current availability. This 32oz., satin-finish teapot won the award for Best New Product at the 2016 World Tea Expo! With a wide-mouth, extra-fine, stainless steel mesh infuser, this pot is perfect for brewing your favorite tea, especially those that need plenty of room to expand! The matching porcelain lid is lined with silicone rubber to hold it in place as you pour. Easy to clean. Comes in lemongrass (pastel yellow), lavender mist (pale lavender), and minty aqua. Check store for current availability. For cold-steeping iced tea, this 64oz., Borosilicate, hand-blown glass jug is a perfect match to the Attic's pre-packaged iced tea sacs! Able to handle hot to ice-cold water. Comes in cranberry, green tea, and ice. Check store for current availability. This extra-fine infuser comes with a hook to use on almost any style of mug. 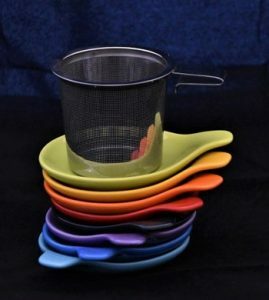 The colored dish keeps your counter-top clean as you store your tea leaves for a second or third brew! These stainless steel and ceramic pieces are dishwasher safe and lead-free. For cold-steeping iced tea, this 50oz., Borosilicate, hand-blown glass jug is a perfect choice. Able to handle hot to ice-cold water. Comes in red, orange, turquoise, and lime green. Check store for current availability. This 15oz. 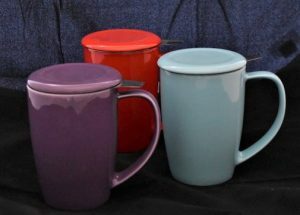 ceramic mug, complete with extra-fine, stainless steel mesh infuser, is perfect for home or office! 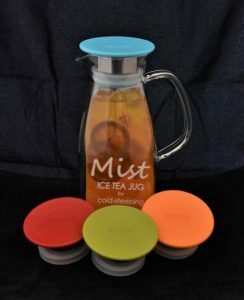 The matching ceramic lid holds in heat and doubles as a holder for the infuser so you can re-steep your loose-leaf tea without staining your counter- or desk-top. All components are microwave and dishwasher safe. The Tea for One is perfect for brewing a single, 14oz. cup of tea. With an extra-fine, stainless steel mesh infuser and stackable cups for easy storage, this unit is perfect for home or office use. Steep your favorite loose-leaf tea in the top mug, pour the tea into the bottom, and then help retain heat as you sip by re-stacking the pieces! Durable and easy to clean. This 16oz., double-walled, stainless steel cup comes with an extra-fine mesh infuser, complete with solid chamber and plunger to prevent over-steeping. The durable construction is spill-proof, retains heat for hours, and resists staining, as well as odor- and taste-transfer. Comes in steel, pearl white, periwinkle, or black. Check store for current availability. The easy-to-clean, high quality enamel is guaranteed not to fade. 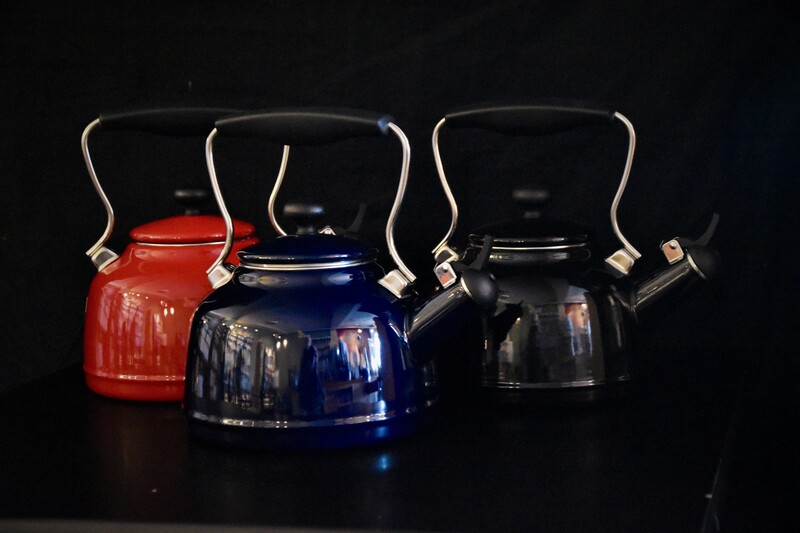 All Chantal enamel-on-steel tea kettles are made with magnetic carbon steel, meaning they work on any type of cook-top-- even magnetic induction! 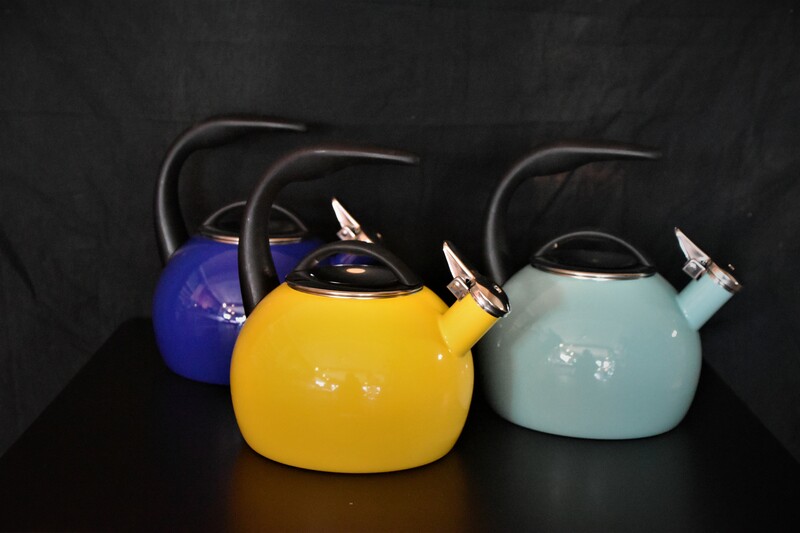 Chantal celebrated its 40th year in business with this fashionable, 2 quart tea kettle. 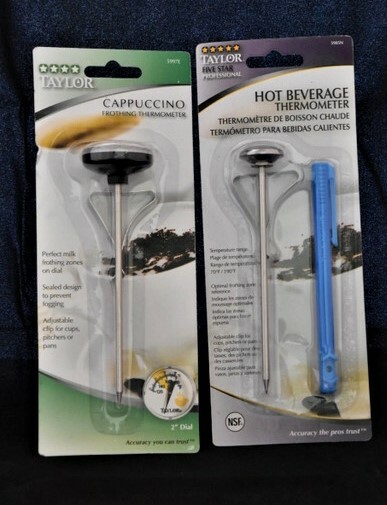 The ergonomic stay-cool handle fits comfortably in the hand for easy pouring, while the wide, flat bottom facilitates rapid boiling. Comes in red, yellow, turquoise, and blue. Check store for current availability. 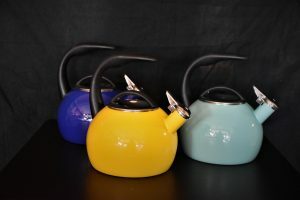 A classic tea kettle with a modern twist! 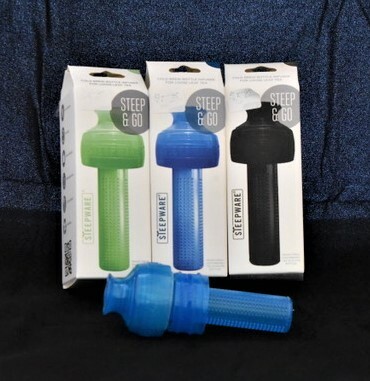 Features a black phenolic stay-cool grip and knob, conical spout with 1-tone whistle, and a wide opening with lid for easy cleaning and filling. 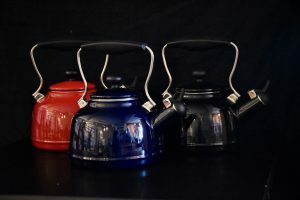 The 1.7 quart kettle has a premium, heavy duty, enamel interior, which is resistant to hard water and calcium build-up. Comes in black, white, navy, and red. Check store for current availability. 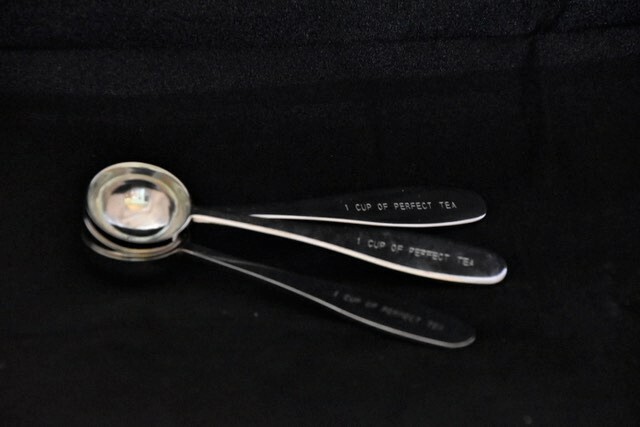 Make sure you have the perfect tools to help you make the perfect cup of tea or coffee! 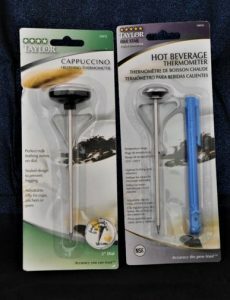 This easy to use and clean thermometer will accurately tell you your milk temperature when heating it up for your own lattes at home! 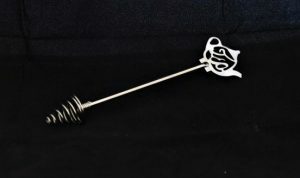 Extract honey from the jar with this easy-to-clean dipper! The grooves perfectly hold the honey as you transfer it to your mug. 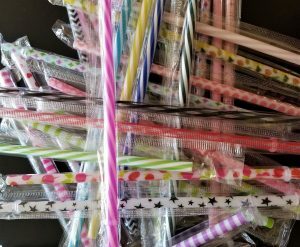 Less messy than a spoon or pouring! This stainless steel measuring spoon will help you brew the perfect cup of tea! Available in a variety of colors and patterns! 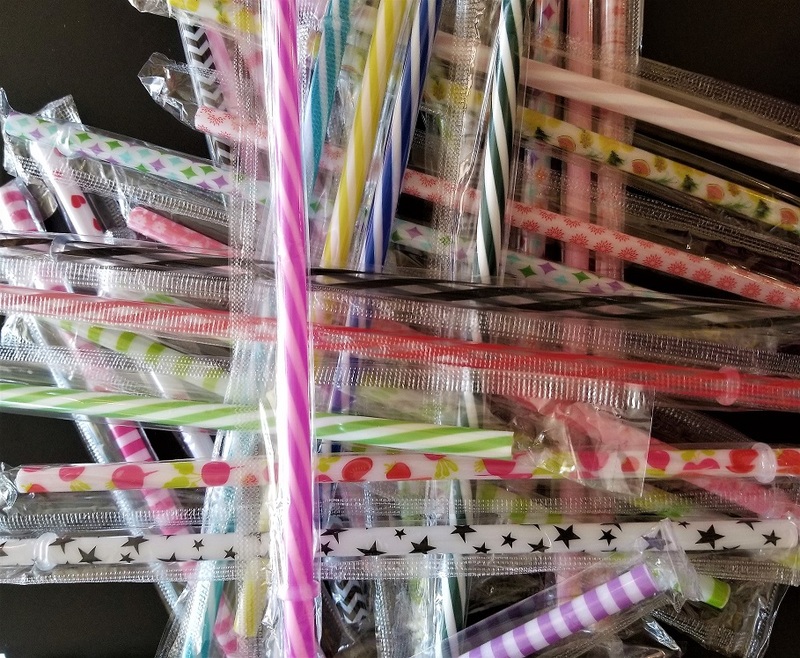 Straws are made from food grade plastic. BPAS and BPA free, phthalate free, PVC free, non-toxic, non-leaching, no metallic taste! Infuse the goodness of whole leaf tea into your water bottle with Steep & Go! This recyclable, eco-friendly infuser can be used again and again with a variety of water bottle sizes. Simply add loose-leaf tea to your water, cap with Steep & Go, and enjoy fresh iced tea in just minutes! Comes in lime green, blue, and black. Check store for current availability. 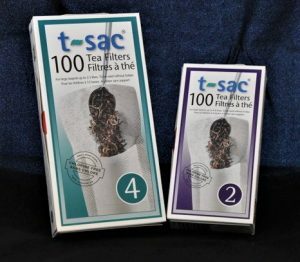 Each box contains 100 filters, for use when steeping tea without an infuser. These metal tea tins will keep your loose-leaf tea safely sealed away until you are ready to brew the next cup! See store for available sizes and colors. Yummy Pup Pet Treats are all-natural, locally made, grain free treats that your furry friends are sure to love! Available in strawberry, blueberry, or peanut butter-banana, the Attic is proud to carry Yummy Pup treats. Stop in next time you visit the Whitney Park dog park and give them a try! Show you care with the gift of coffee, tea, and books! Available in-store in $5 increments.